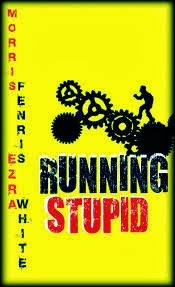 "Running Stupid" is a new crime fiction book, specifically an imaginative thriller, with lots of humor and suspense. The story follows Matthew Jester, someone whose luck seems to have no limits. For instance, he purchased a failing ice cream shop, only to have wealthy enclave be built on the land soon after. When Jester decides to try his luck, he ends up in a series of non-stop difficult situations, involving serial killers, kidnappers, and various other criminals -- many of them trying to kill him. The plot is incredibly engaging, and there is not a moment where you'll wan tot stop reading -- and the ending will have you gasping. Characterization of Matthew Jester is thorough, and you find yourself understanding him, whether or not you are rooting for him. There is also a lot of humor in the book, including strange images, my favorite being a prophetic fairy who wears an NYC baseball cap and smokes cigars. If you are someone who wants a fresh, unique, funny, riveting thriller, then "Running Stupid" is the perfect novel for you.